A rather quiet week is in the books for the Roadrunners, a seven-day span that called for only one game ahead of a week – of which is currently upon us – that will serve as the busiest of the season thus far, hockey-wise, with a four-game-in-six–day run set to begin Tuesday night. A quick rewind to last Monday! 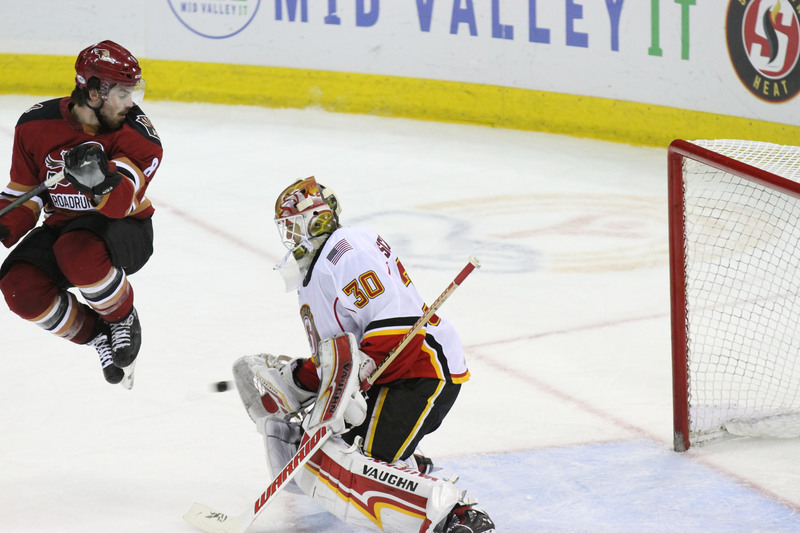 Hunter Miska made his NHL debut when he relieved Darcy Kuemper with 18:16 left to play in the Coyotes’ 6-1 loss to the Detroit Red Wings at Little Ceasars Arena. He made eight saves on nine shots faced. Miska became the 20th Roadrunner to appear in a game with the Coyotes upon a recall from Tucson, the fourth goaltender, and the 11th to make an NHL debut doing so. Back to the week! One game, one result – a loss, and one season debut. 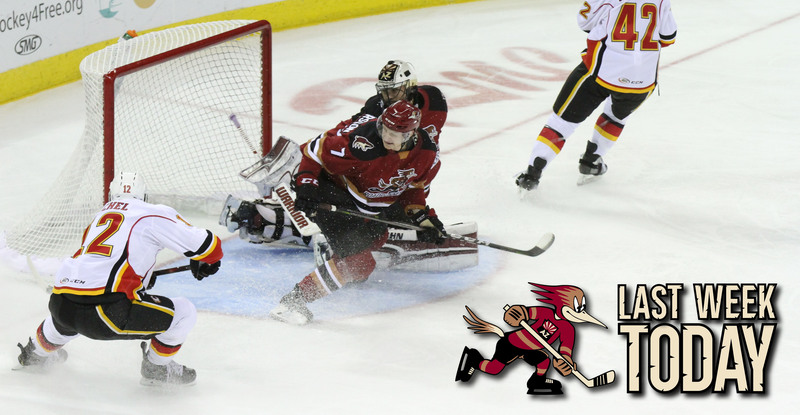 The Roadrunners dropped their fourth game of the season in regulation Friday night at Stockton Arena, a 3-1 loss at the hands of the Stockton Heat. Kevin Ekman-Larsson made his season debut, serving up an assist to set-up the team’s lone goal of the evening. Hey, captain! 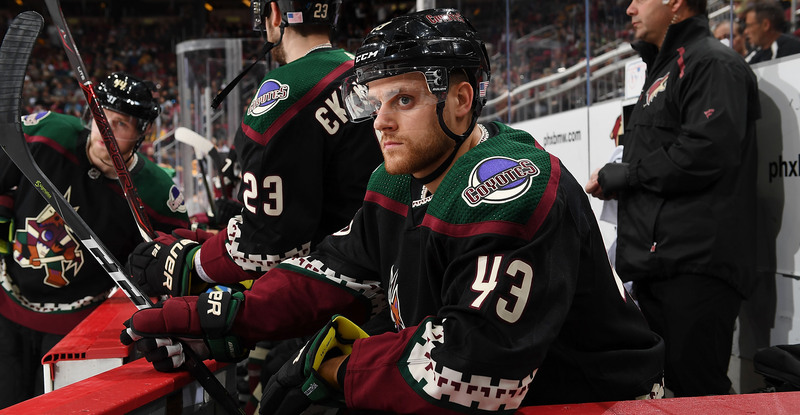 Dakota Mermis was inserted into the Coyotes’ lineup on Saturday night, appearing in his 10th NHL game as he played 11:20 in Arizona’s 2-1 loss to the Boston Bruins at Gila River Arena. In total, three Roadrunners earned NHL recalls to the Arizona Coyotes this week, including Robbie Russo, who joined the parent club Friday, and Mario Kempe, who caught a flight to join the Coyotes following Saturday night's game in Stockton. Documented earlier, a pair of 2018-19 Roadrunners got a taste of action with the Coyotes this week, Hunter Miska making his NHL debut on Tuesday night in Detroit and Dakota Mermis playing in his 10th NHL game on Saturday. Lawson Crouse, who registered 32 points (15G, 17A) in 52 games with the Roadrunners last season, scored his third goal of the year on Tuesday night at Little Ceasars Arena in Detroit, Michigan, beating Jimmy Howard with a snap shot to the top right corner. Kevin Ekman-Larsson, making his season debut Friday night in Stockton, read a cheating defense and a flying Hudson Fasching, lofting a stretch-pass through the neutral zone. Fasching, behind coverage, skated into Ekman-Larsson’s feed in-stride, walking in along to beat Nick Schneider to the blocker side, netting his fourth goal of the season to open the scoring at Stockton Arena.